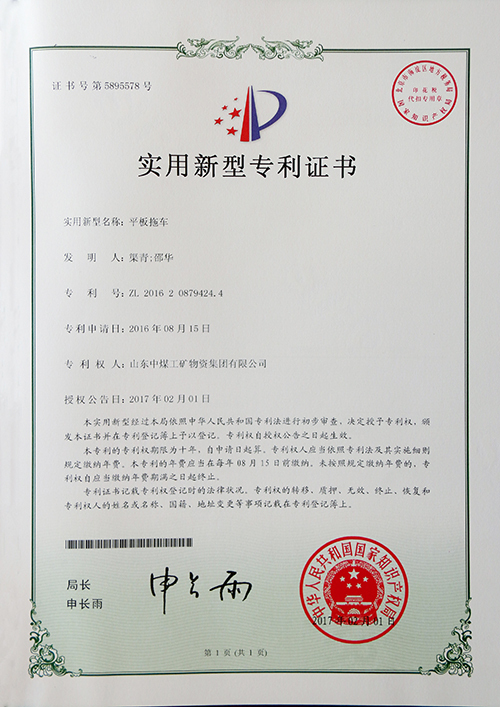 Recently, a good news came from China Transport Group, the procduct--flatbed trailer, which developed independently by China Transport Group passed the audit of the State Intellectual Property Office and obtained the Certificate of Utility Model Patent according to the Patent Law of the People,s Republic of China(Cert. no: 5895578, Patent no: ZL 201620879424). The flatbed trailer which get the national utility model patent is a new generation of products from our group's latest research, widely used in handling of paper-making factory, household appliances, chemical and industrial raw materials or other finished goods. All products are made by the professional processing with high-quality steel, and equipped with heavy-duty tire for special project that also used by famous brands of domestic engineering vehicles. It has many advantages of good loading capacity and fine safety factor, good tyre elasticity, far mileage, stable performance etc. It is a main equipment to improve the handling speed and achieve mechanization in the transportation field. The product are widely praised by customers at home and abroad since puttting into the market. As national abiding by contracts and keeping promises enterprise, China,s machinery industry outstanding enterprise, Shandong Province IOII innovation demonstration enterprise, Shandong Province and Jining City "one enterprise one technology" innovative enterprise, Jining City Technology Center, Shandong China Transport Group vigorously implement the strategy of intellectual property rights, through the combination of production and research, independent innovation; the implementation of science and technology enterprises, talent-level strategy, increase investment in scientific research and technological innovation, accelerate the realization of new products, new technologies. China Transport Group,s continuously improve innovation the level of research and development capabilities and technological, at present our Group own more than 50 national computer software copyrights, 29 national utility model patents, which greatly improved the core competitiveness of our products. The patent that we obtained in this time marks we have reached a new height in respect of technological innovation. Also it has important significance for enhancing the core competitiveness of China Transport Group and expanding the global sales market for our product.